Originally published in the Infectious Disease Advisor. According to the results of a study published in the Annals of Emergency Medicine, midturbinate swabs for influenza detection provided a more comfortable experience for patients compared with traditional nasopharyngeal swabs, with only a small decrease in test sensitivity. To compare the diagnostic accuracy of a polymerase chain reaction molecular influenza test based on swab location, 484 adults and children presenting with influenza-like illness at emergency departments were enrolled in this prospective study. Specimens for testing were collected with nasopharyngeal, midturbinate, and nasal swabs for each patient. Diagnostic accuracy was assessed based on the results of the nasopharyngeal swab test. Discomfort was compared among the 3 swab types using the 6-point Faces Pain Scale-Revised. Overall, the prevalence of influenza was 30.0%. 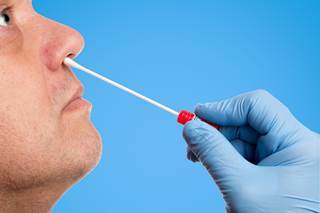 The sensitivity was higher for the midturbinate swab compared with the nasal swab (98% vs 84.4%), and the specificity was similar between the two (98.5% vs 99.1%). Patients reported the most discomfort for the nasopharyngeal swab (median 3 out of 6), followed by the midturbinate swab (1) and the nasal swab (0). Dr Frazee noted, however, that, “incremental improvements in flu testing methods are only important to the extent that they can lead to an improvement in management,” which is currently only possible for high-risk patients. Edited on June 19, 2018.